I am writing in much lighter vein today, having dispensed with the drug mafia last week. But don’t let that weigh heavy on your barometer or allow your windsock to flop. Since there are some smiles in the mix together with the satire. However diabolical these goings-on may seem, there’s always a cloud in the silver lining. Therefore remind yourselves that if angels can fly, it’s because they take themselves lightly. Before we get our tails caught in a crosswind, let’s rehash the basics of the Beaufort scale – an internationally recognised measure of weather. BS1: CALM. Stay calm. Customs officers at BIA keep their cool despite a Kuwaiti couple losing their shirt over a brace of canines being declared as contraband. These Arab tourists have gone to the dogs… now keep your shirt on! BS4: GENTLE BREEZE. 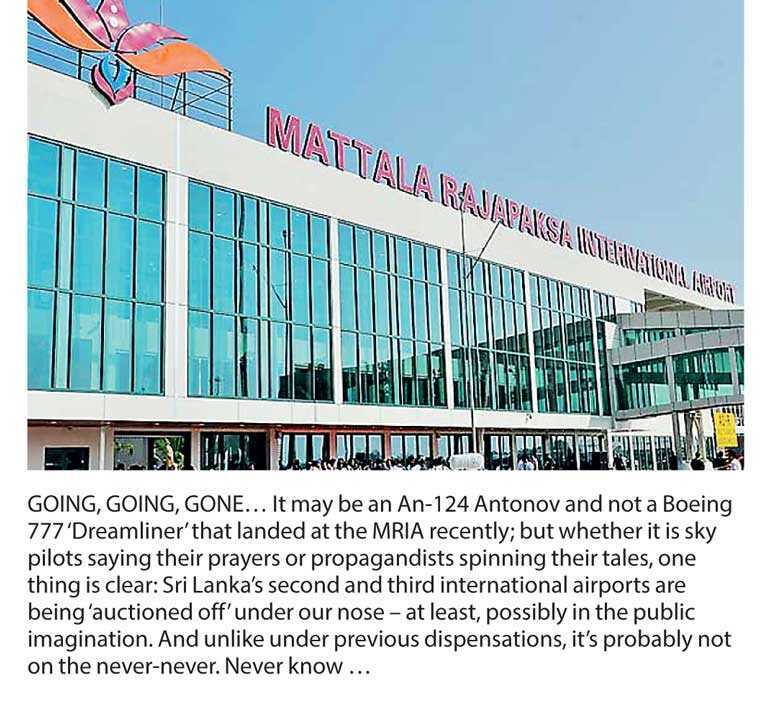 The incumbent administration can barely contain its glee at the announcement last month that the Mattala Rajapaksa International Airport is to be closed – due to low (read nil) demand, despite the venue once being popular for the temporary storage of paddy. “What a breeze it’ll be,” wheezed a former prez, an old geezer, out of breath at the prospect of airport, port, port city, etc. being named after him. BS5: FRESH BREEZE. The criminally propagandistic cabal defending an erstwhile regime rattles sabre by pointing out that in April of this year, an Antonov An-225 (NATO or North Atlantic Treaty Organization codename: ‘Mriya’) touched down at the MRIA (NATO or No Action, Talk Only codename: ‘Mria’). BS6: STRONG BREEZE. The erstwhile regime can barely contain its glee as a second Antonov – the world’s second-largest cargo carrier – touches down at MIA – er, MRIA. Stony silence from criminally propagandistic incumbent administration apologists. BS7: NEAR GALE. Incumbent administration proudly announces the Greater Trinco area development plan, positioning Hingurakgoda Airport (codename: HA) as the gateway to the east. BS8: GALE. Erstwhile regime points out that Batticaloa Airport (codename: BA) had previously been launched under the same banner. HA! HA! laugh the lackadaisical laggards, who dare not say BA! to leading lights. BS9: STRONG GALE. Aviation and aeronautical experts scratch their heads in mutual mystification. Who do these politicos think they are? Loonies! BS10: STORM. China claims that China Bay area (codename: CB) must be developed by China, because it bears a Chinese name. A previous president (codename: CBK) scoffs at how these Chinese roll (codename: ‘Chinese rolls’). BS11: VIOLENT STORM. India jumps in on the side of CBK – having previously parachuted parippu as an airdrop over JR – to say that it must have a share of Hambantota since the harbour area is famous for its humbugs (AKA ‘the Regime’). BS12: HURRICANE. The USA looks askance at all of these goings-on in the South Asian region, begging to know what gives India the right to air their graces around an Ocean mistakenly named after the Indian subcontinent by an erstwhile empire (AKA ‘the Empire’ or BE – and not to be confused with ‘the Regime’, whose motto was never ‘To BE or not to BE’). And never mind how the Chinese rolls, if there’s oil in the Gulf of Mannar – moon or no moon – we’re in like no one’s business, by Mars! by Jove! (Just trying to BE like the British, but with more money and pizzazz – not to BE confused with pizzas, which are a type of Indian ‘Chinese roll’).